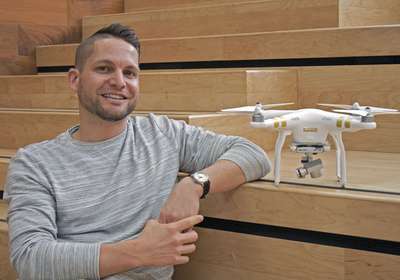 Canadian airspace is adapting to the rise of uninhabited aerial vehicles (UAVs) or, drones, which now outnumber piloted aircraft in our skies, and a new study from the University of Calgary shows this has led to a growing number of incidents and safety concerns. The study — published online in the Journal of Unmanned Vehicle Systems — examines drone incident data in Canada from the Transport Canada Civil Aviation Daily Occurrence Reporting System (CADORs) database. Between November 2005 and December 2016 a total of 355 drone incidents were reported in Canadian airspace. Of these incidents, 66.5 per cent were drone sightings with 22.3 per cent involving close encounters between drones and piloted aircraft. These incidents began to rise dramatically after 2013, a time at which drone technology became more readily available to consumers. "Drone use has skyrocketed, and with that comes new potential safety concerns," says geography doctoral student Paul Nesbit, who led the study, along with co-authors, associate professor Chris Hugenholtz and research associate Thomas Barchyn. "The spike in incidents seems to correlate with the proliferation of consumer drone technology, which is affordable and requires virtually no training to operate." Hobbyists have been flying model aircraft safely in Canadian airspace for decades. But in recent years, drones requiring substantially less skill to operate have entered the airspace. "This is fueling new opportunities for research, commercial, recreational, and humanitarian applications," notes Nesbit. "The potential problem with the rapid rise of drones is that the technology is now accessible to people who may not be aware of, or who choose to ignore Canadian airspace regulations," adds Hugenholtz. He also notes that the nature of the incidents uncovered in the study point to drone operators who are unlikely to hold drone certifications from Transport Canada or have training in airspace regulations. "These individuals could damage Canada's nascent drone industry," Hugenholtz says. Recognizing these new safety concerns, Transport Canada has legislated new guidelines that clarify drone regulations, also establishing fines for those breaking the rules. Further, they have enacted a new online system allowing anybody to anonymously report unsafe drone activity. Drone manufacturers have been proactive too, adding geo-fencing features to some drones, which prevent users from flying in restricted airspace. Despite these precautions though, Hugenholtz says there's still a lot of work to be done to safely integrate drone use in Canadian airspace. "This study confirms anecdotal evidence from a growing number of media reports suggesting a rise in drone incidents in the last few years," says Hugenholtz. "Our results speak for themselves—drone incidents increased up to the end of 2016. However, there are a growing number of educational, regulatory, and technology-based solutions emerging that we believe will reduce drone incidents moving forward."